Thanksgiving is here again and with it comes a flood of feelings and memories. This is a special and complicated celebration which congers up images of feasting and family get-togethers. Along with the delicious food and being with friends and relatives, Thanksgiving is also a time for personal reflection and putting life into perspective. Historically, we remember the hardships endured by the early colonists and their religious faith which sustained them through the worst of times. Even after all of their suffering, their spirit found it possible to give thanks to God for surviving and enduring. As a national holiday, Thanksgiving stands as a symbol of the positive American spirit which proclaims that, no matter how difficult things may have been, there are good times and blessings for which to be thankful. Emotionally, rediscovering the gratitude, which may have been lost in the wake of hardship, is an important spiritual experience and expression of faith. Thanksgiving is a symbolic ritual of affirmation and confidence about the ultimate nature of life, i.e., that when all is said and done, the good in life outweighs the bad. Thanksgiving expresses a leap of faith that believes that the cosmos has a greater and essentially a beneficent purpose for its inhabitants. Ironically, this joyous time can also be a time of heartache and interpersonal conflict. 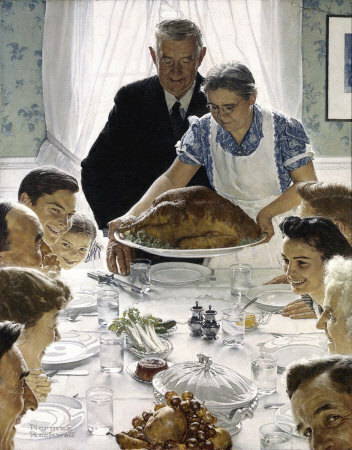 The Norman Rockwell painting which we all would like to experience is, sadly, not part of what many families experience. Family gatherings where relatives , who normally live apart, get together can be the occasion of arguments and emotional tension. Wounds from the past can be reopened and intense pain and longstanding problems and disputes can be rejoined. For those who dread this gathering, here are some tips to reduce your anxiety and help you get through the day. 1. Think ahead. What part of the family experience is most difficult for you ? Be specific and understand when and where it occurs. Ask yourself questions like , “Who is involved ?” and “How does the stressful moment develop ?”. Knowing these trigger can help you to avoid them. 2. Shake things up. Don’t get caught in the same old rut. Imagine how you might approach and do things differently to avoid repeating the same old problems. Pay attention to where you sit or who you stand next to. Think about topics to avoid or changing the subject when toxic issues appear. 3. Know your own body. Emotional distress starts in the body with muscular tension. Know where your “organ of distress” is ( e.g. you stomach , back, chest or throat, or jaw etc.) When it acts up, understand that you still have some time to remove yourself from the situation before getting upset. 4. Don’t get sucked into impossible conversations or arguments. Don’t engage in conversations you know are going to end badly. Remove yourself from a situation which is getting uncomfortable before things get ugly. 5. Talk things over with your partner ahead of time. Let your partner know what your concerns are and have an escape plan. Also let the kids know about it ahead of time and … don’t be afraid to use it. A little planning can take away much of the stress of family gatherings and free you up to enjoy the spirit of this special time, Happy Thanksgiving, everyone !